Palmerston North Marist Old Boys (from left) Peter Richards, Paul O’Brien, Mike Keenan and Ted Dawick, at the entrance of the Marist Sports Club building for the inaugural Palmerston North meeting of The Marist Brothers Champagnat Trust, 14 April this year. ‘A very important step towards sharing St Marcellin Champagnat’s spirituality and vision has been taken with the establishment of the Marist Champagnat Trust. I am delighted on behalf of the Marist Brothers to endorse the Trust’s objectives and look forward to their support in ensuring that the Marist mission will continue and develop into the future.’ Brother David McDonald FMS, District Leader (Marist Brothers’ District of the Pacific), December 2013. 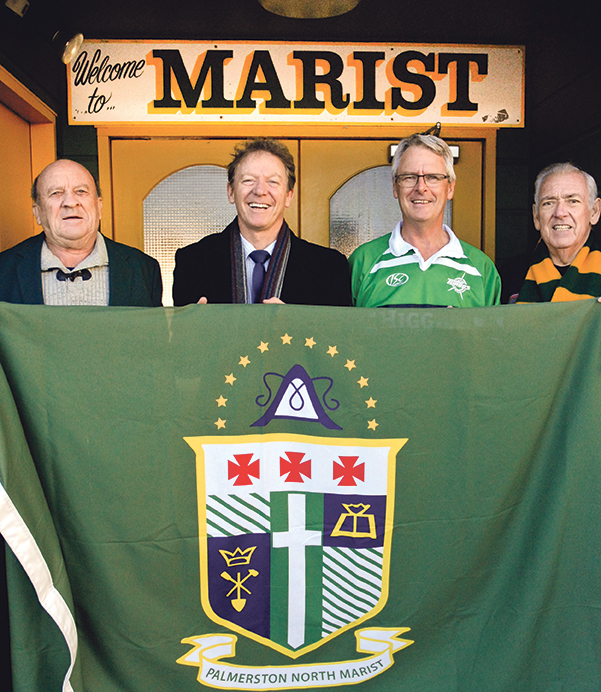 The work of a passionate group of Marist Old Boys, teachers and friends of the Marist Brothers to set up a nationwide trust with a Pacific outreach, came to fruition at the launch of the Marist Brothers Champagnat Trust, 15 December 2013. The Trust was launched in front of 50 Brothers and 100 supporters at Sacred Heart College, Auckland. Why was the Trust set up? For a variety of reasons but mainly to ensure that the spirit and good work of Marcellin Champagnat and the Marist Brothers continues well into the 21st century and beyond. 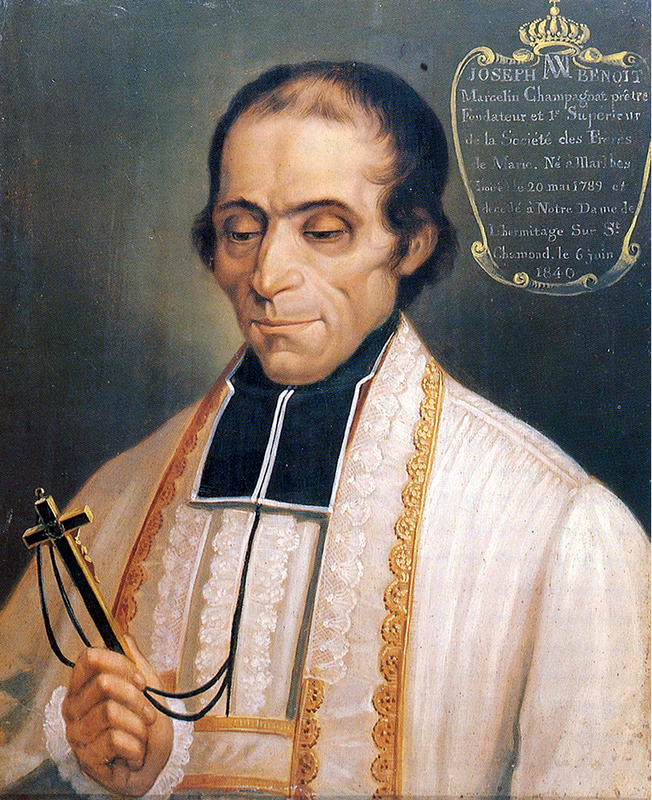 Marcellin Champagnat (1789‒1840) grew up and was educated in France. During this time Europe was the scene of cultural, political and economic upheavals – it was a time of crisis in society and the Church. This prompted Champagnat’s response in 1817 to founding the Institute of the Little Brothers of Mary, known as the Marist Brothers. His vision was ‘to go out and educate those most in need’. Since then Marist Brothers’ presence, dedication and achievements in education have influenced thousands of students in over 80 countries of the world. But today, with diminishing numbers of Brothers, the charism or spirit of Marcellin and his concern for the welfare of disadvantaged young people needs to be continued in ways other than simply by the presence of Brothers. Although present in over 80 countries, the main area of operation for New Zealand Brothers is the Pacific – New Zealand, Fiji, Samoa, Kiribati and Tonga. Having opened and run many schools in New Zealand and the Pacific, the Brothers have maintained strong traditions and presence based on Champagnat’s original dreams and vision. The Trust aims to support and continue this work. The Trust has three important broad goals. To invigorate, promote and share Champagnat’s vision in Marist communities in the New Zealand, Pacific and Asia areas. To encourage former pupils of Marist Brothers’ schools, friends and supporters of the Brothers to become ‘friends’ of the Trust, either by financial contribution or volunteering of service. To support and care for the Marist Brothers. The Trust is not concerned with building-projects, but rather in developing ‘human capital’, enabling disadvantaged young people to better themselves – educationally, socially, religiously, and humanly. How will this be done? Basically, by building up a database of ‘friends of the Trust’ – old boys, friends, like-minded people – the Trust will maintain contact through newsletters, brochures and potentially annual meetings. Anyone interested – and this doesn’t just apply to Marist Brothers’ past pupils – can find out more on the web (maristbrothers.org.nz) or email Br Doug Dawick at brdougfms@gmail.com and sign up! to provide examples of good living, work habits and skills for employment. And how relevant still today, almost 200 years later! St Marcellin’s Feast Day is 6 June.